The trouble seems to continue. 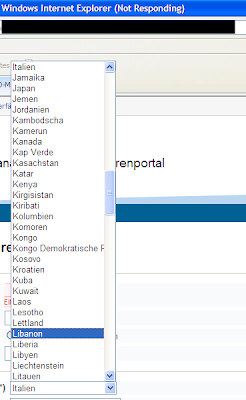 In one of our apps, when clicking on a dropdown list, IE8 hang up completely. I quickly searched for similar problems and apparently IE has its issues with dropdowns. Anyway, here's a quick guide to a fix that worked for me. After I got notified by one of our clients, I setup a virtual machine with XP and IE8 installed and indeed, I was able to successfully reproduce the odd behavior. Basically when opening the dropdown and selecting an entry the browser completely blocked. ...and see there, everything worked as expected and also IE8 didn't hang no longer. Don't ask me why this happened, but it seems to work now.